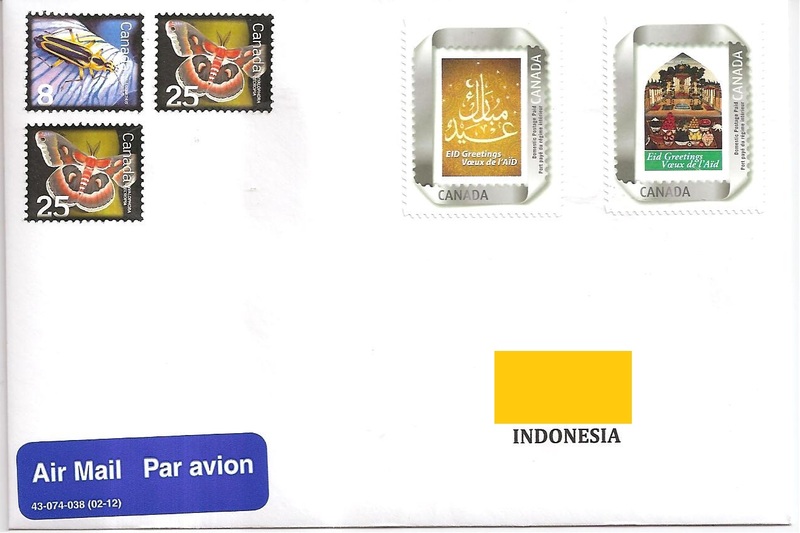 Covers: China (4x), Croatia (2x), France (4x), Germany (2x), Indonesia, Malaysia (5x), Singapore, South Korea, Spain, Taiwan, and USA. 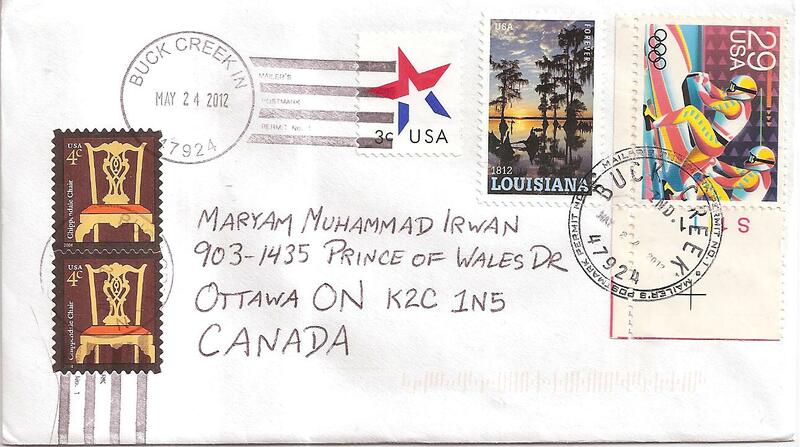 My first travelling envelope has arrived home today! 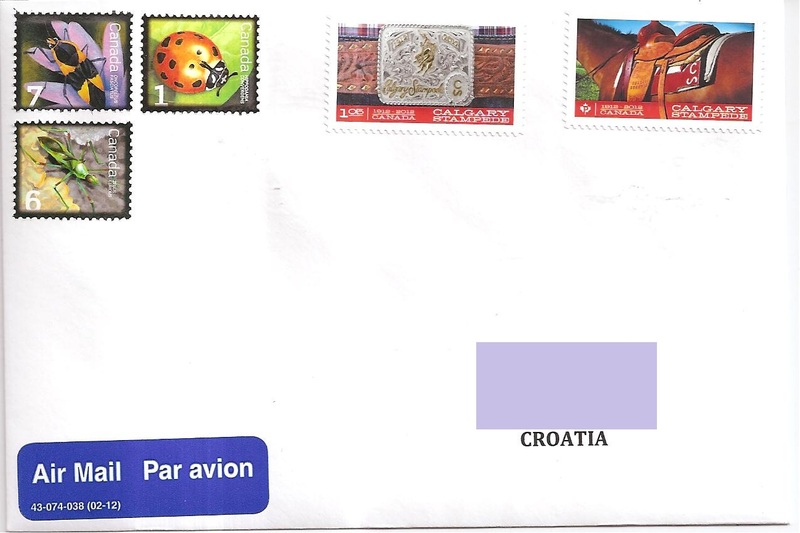 This is my first try with the Travelling Envelope Round Robin group in postcrossing forum. There are three members in my group, the other two are photo313 from Thailand and anglez from UK. 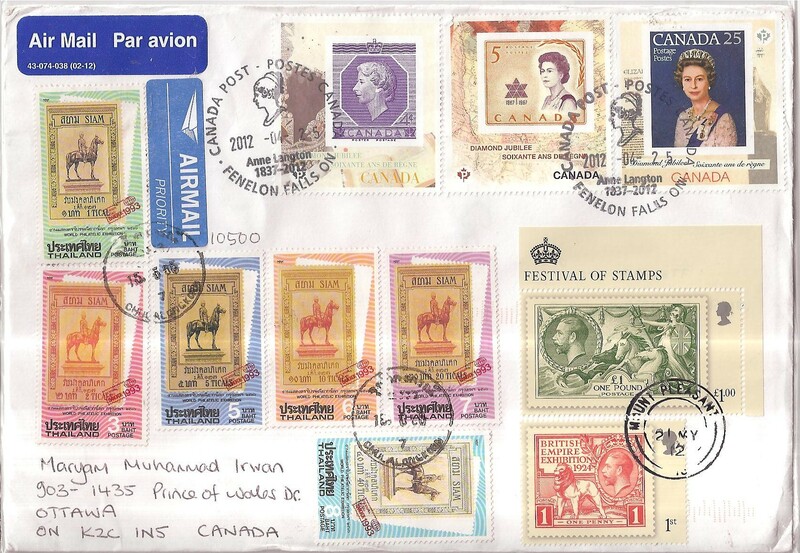 All of us used ‘stamp on a stamp’ stamps for the cover. 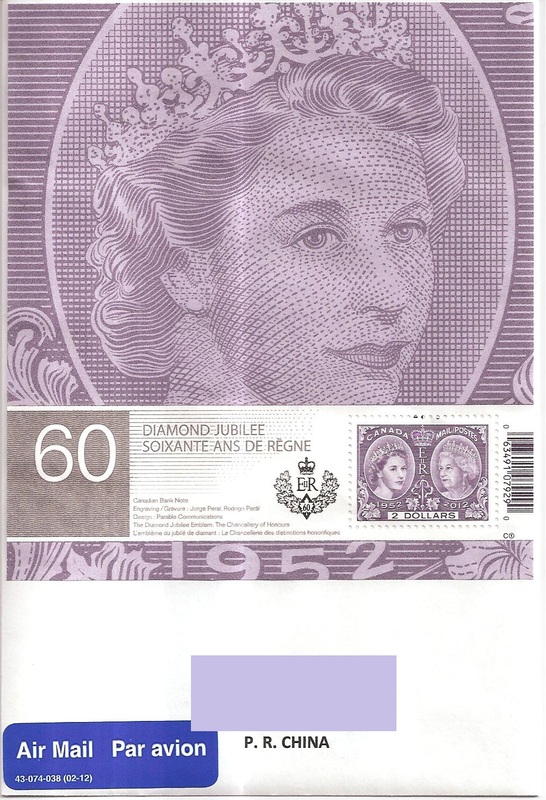 I used three Queen Elizabeth II Diamond Jubilee stamps, cancelled on 25 April 2012 at Fenelon Falls in Ontario. 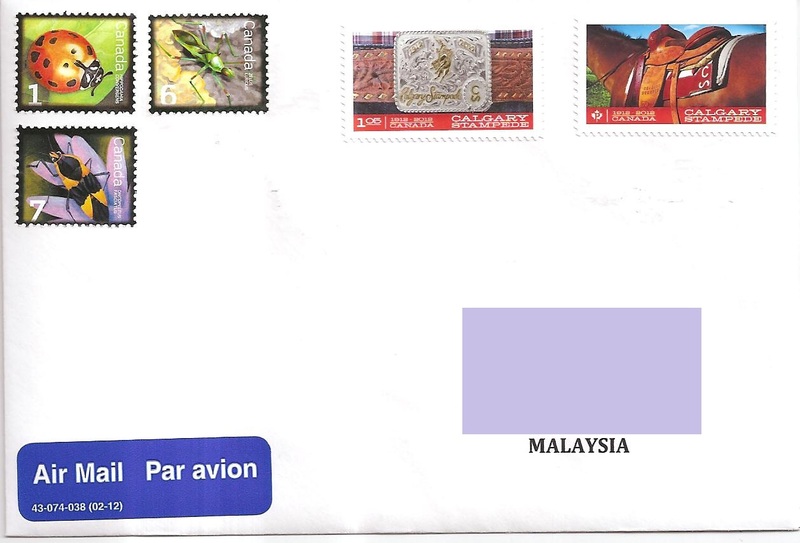 Then photo313 affixed six stamps that commemorate Bangkok 1993 World Philatelic Exhibition, cancelled on 15 May 2012 (or the Buddha Year 2555) at Chulalongkorn. 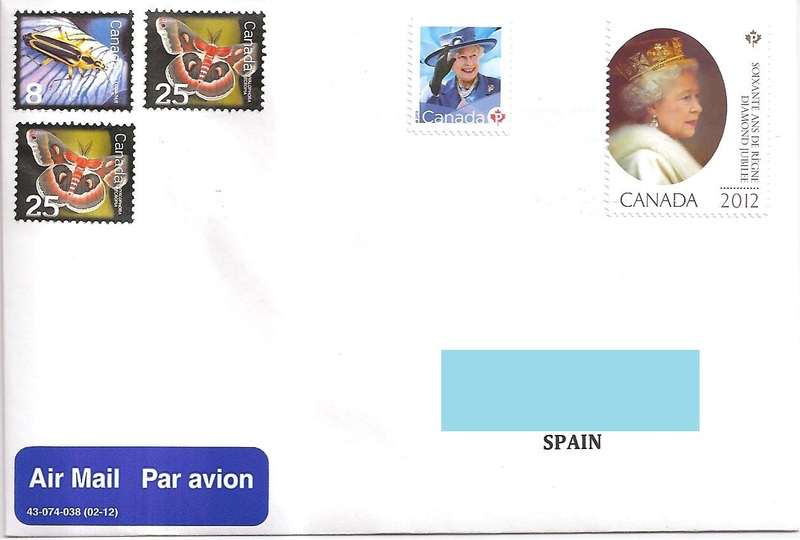 Finally anglez affixed two stamps that feauture King George V, cancelled on 21 May 2012 at Mount Pleasant. Thank you very much photo313 and anglez, and thank you canbcpost for arranging the round robin! 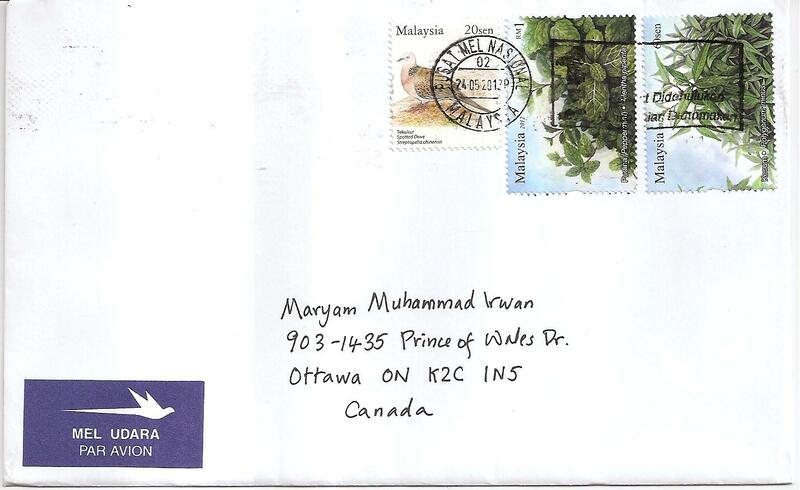 This is the second cover I received from Wei Xu yesterday. 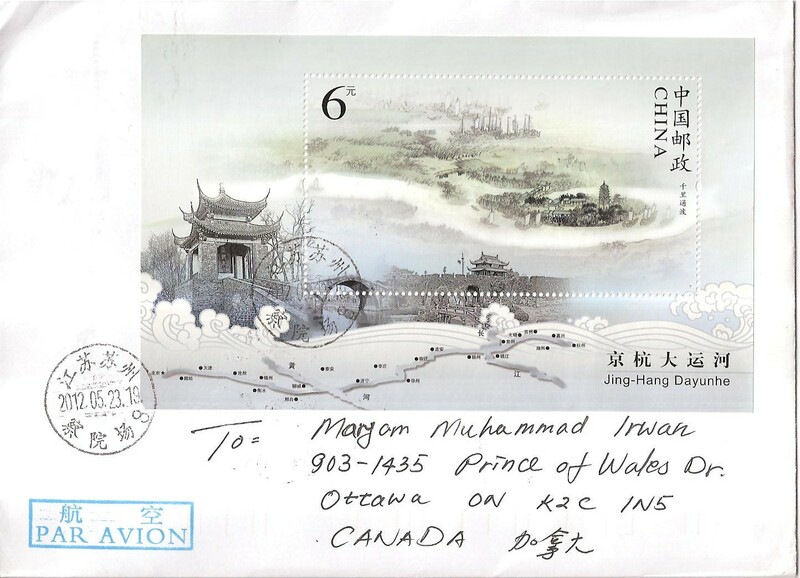 On this cover, Wei Xu affixed a souvenir sheet that features the famous Grand Canal of China that links Beijing in the north to Hangzhou in the south. Another great and marvelous creation of Chinese civilization. The souvenir sheet looks gorgeous! 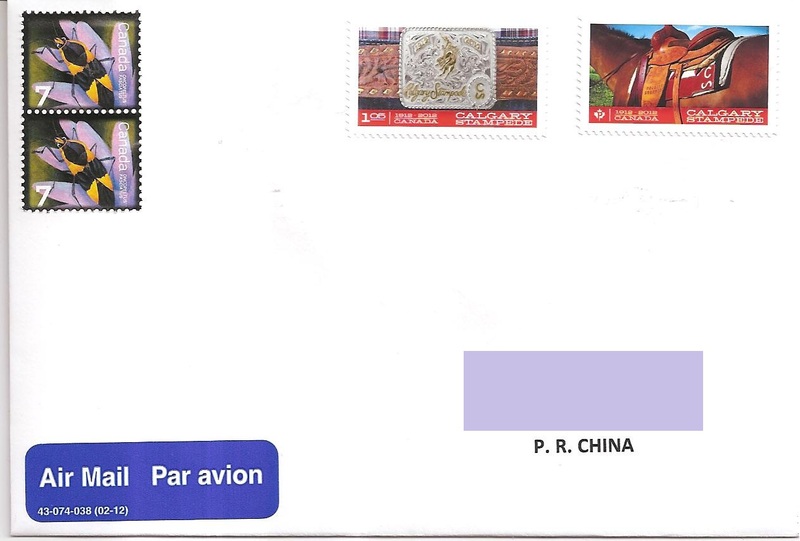 The postmark date is 23 May 2012. Thank you very much Wei Xu! 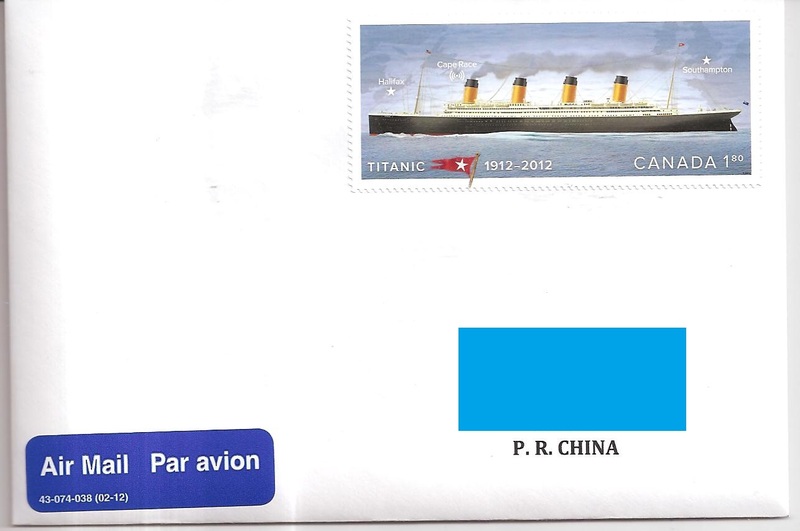 Yesterday I received two covers from my friend Wei Xu from China. This is the first cover. 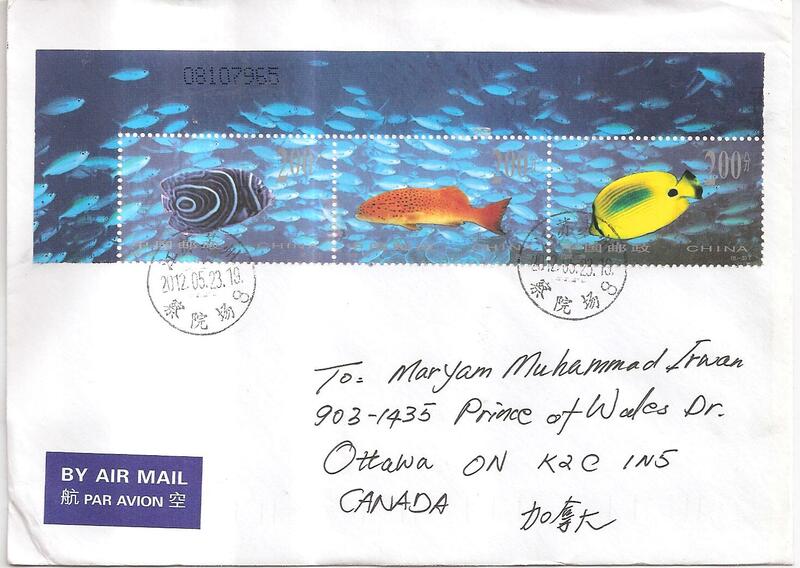 Wei Xu affixed a sheet of three fish stamps. They are so beautiful. 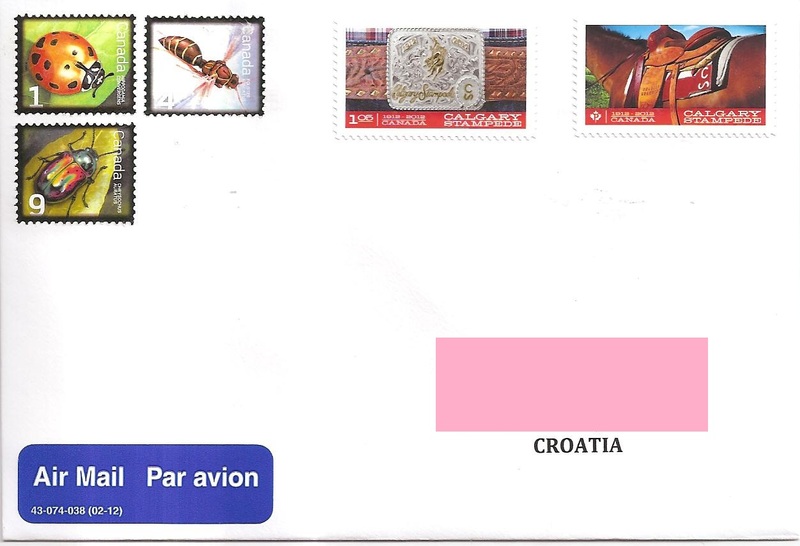 The postmark date is 23 May 2012. Thank you Wei Xu! 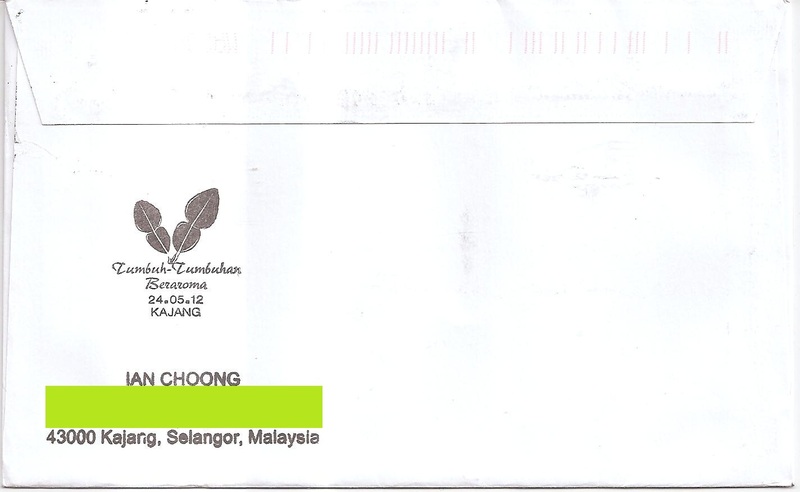 Yesterday I received an FDC from Malaysia, sent by Khor Kok Keong from Perak. The FDC is about aromatic plants issued on 24 May 2012. 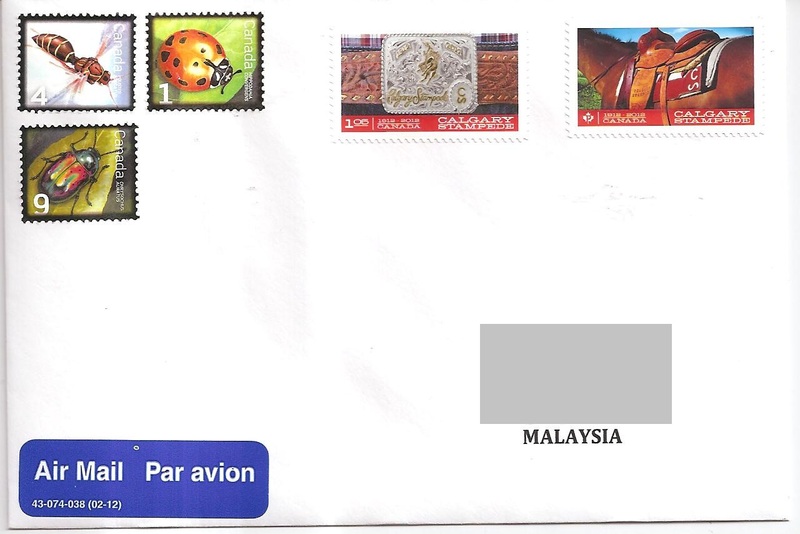 Khor sent the FDC from Ipoh, Perak. Inside is a pamphet about the issue. 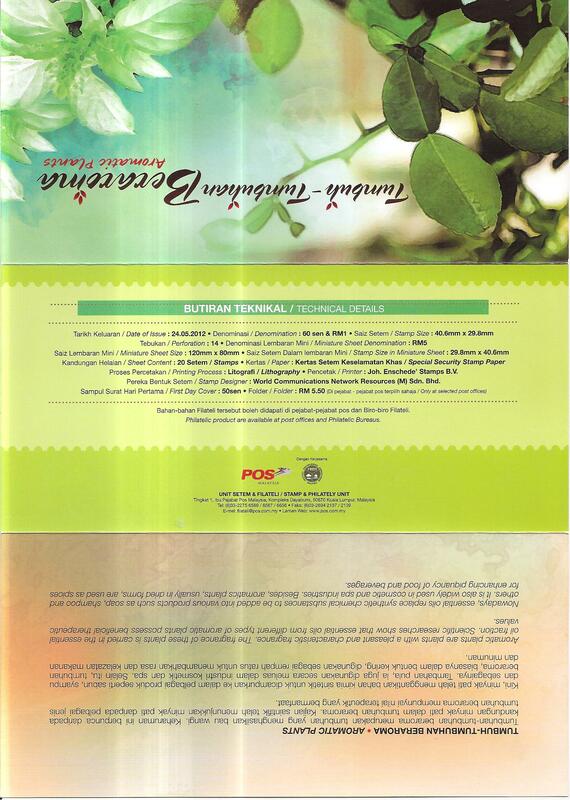 Altogether there are four plants that are featured in this issue: kesum, pudina, daun limau purut and bunga kantan. Here in Ottawa the first three plants are available in Chinatown: kesum – laksa leaves or vietnamese mint, pudina – peppermint, and limau purut – kaffir lime leaves. Bunga kantan – ginger torch flowers are really hard to get. Since I was here in 2006 until now, I haven’t found bunga kantan yet. 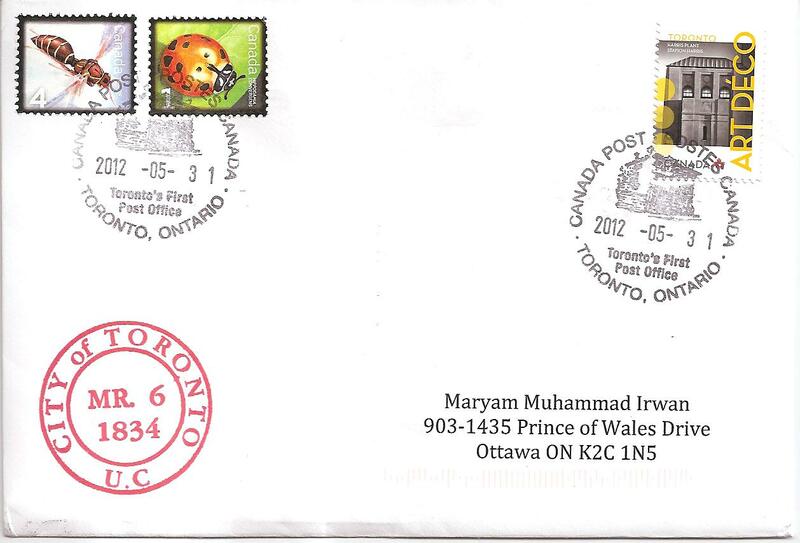 Ten days ago I sent a cover for myself to be cancelled at Toronto’s First Post Office. 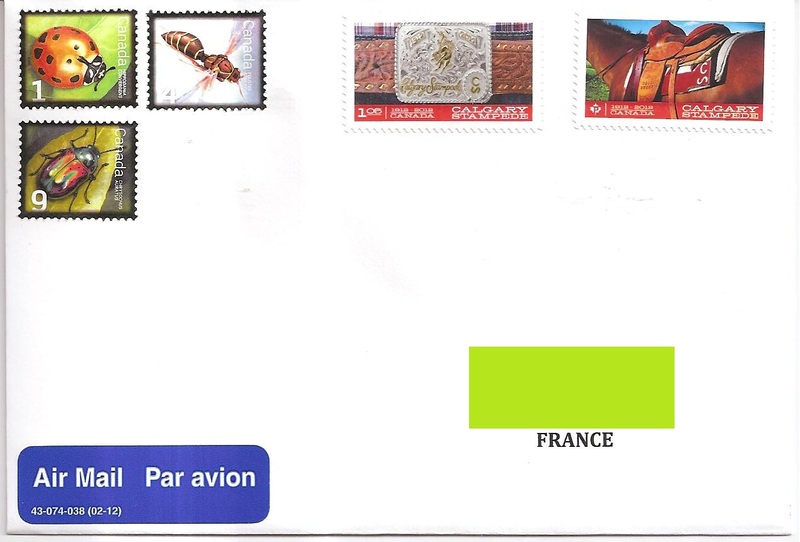 Today I received the cover back, with nice cancels! 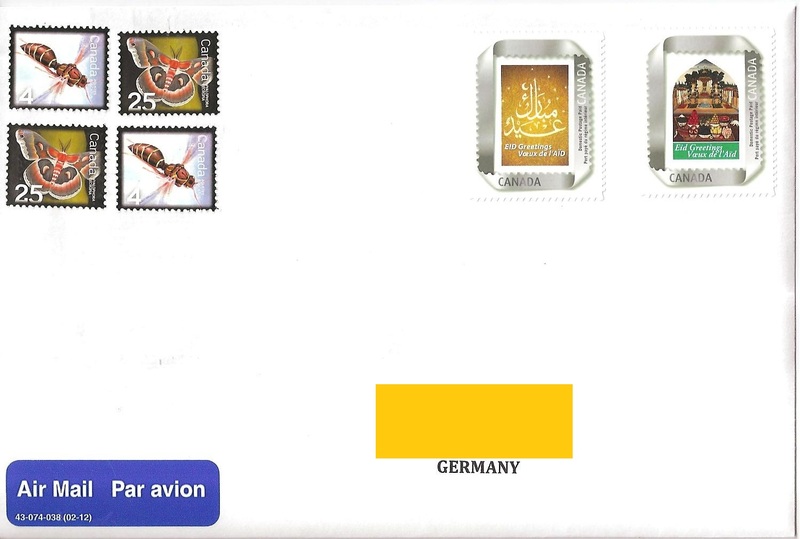 The postmark date is 31 May 2012. Thank you very much postmaster for the beautiful cancels! 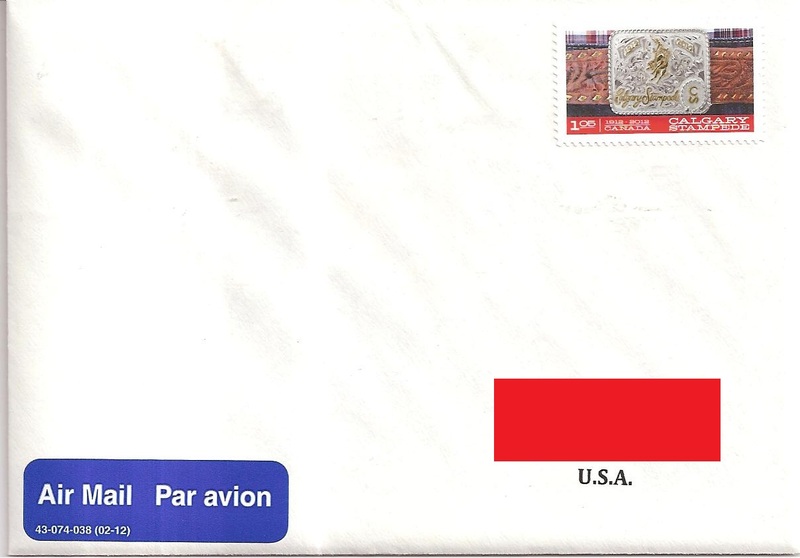 Yesterday I received a cover from Tim Schnepp from Indiana, USA. 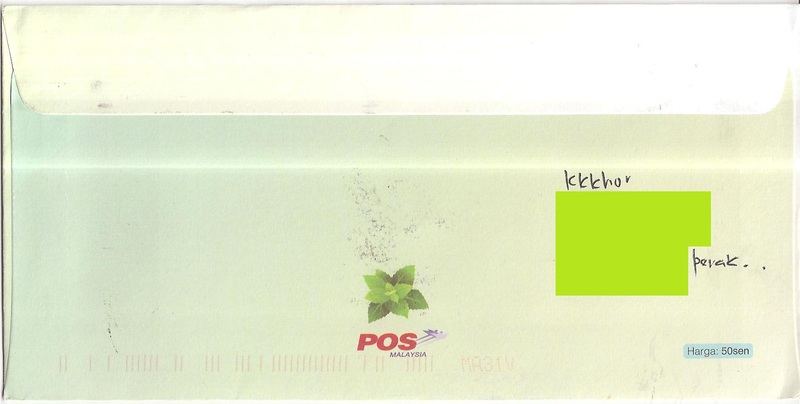 This is the third cover that I received from Tim. 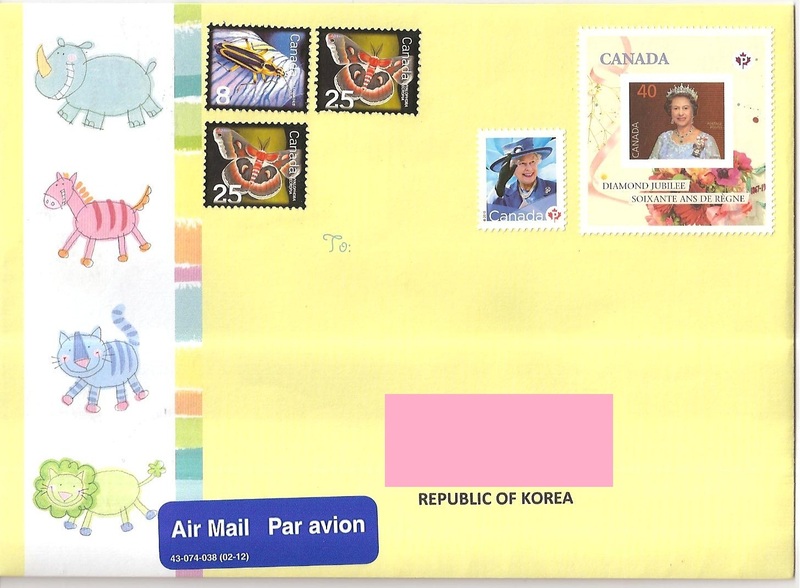 On this cover, Tim affixed five colorful stamps. The cancels are from Buck Creek, Indiana. 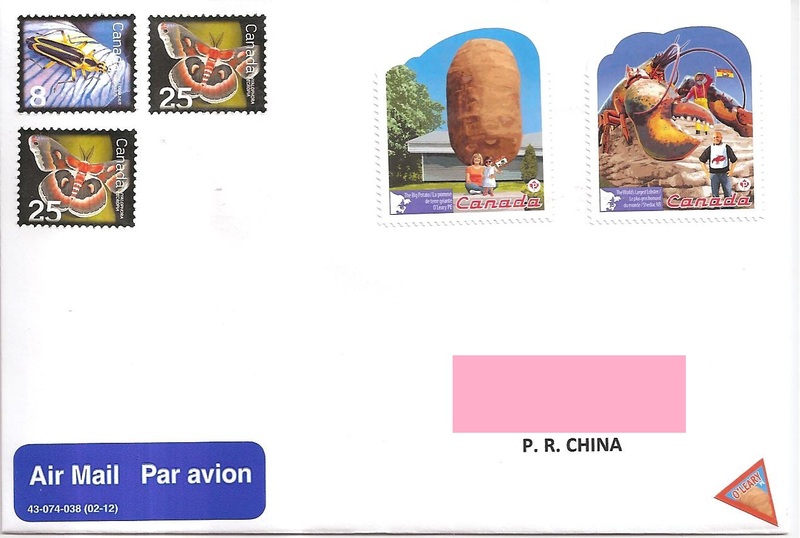 The postmark date is 24 May 2012. Thank you very much Tim! 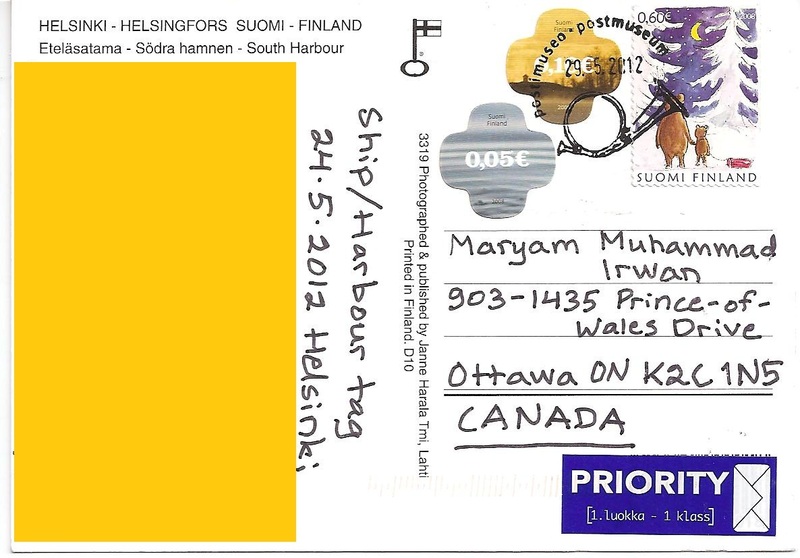 Yesterday I received a postcard from Finland, sent by postcrosser Spelkone from Helsinki. 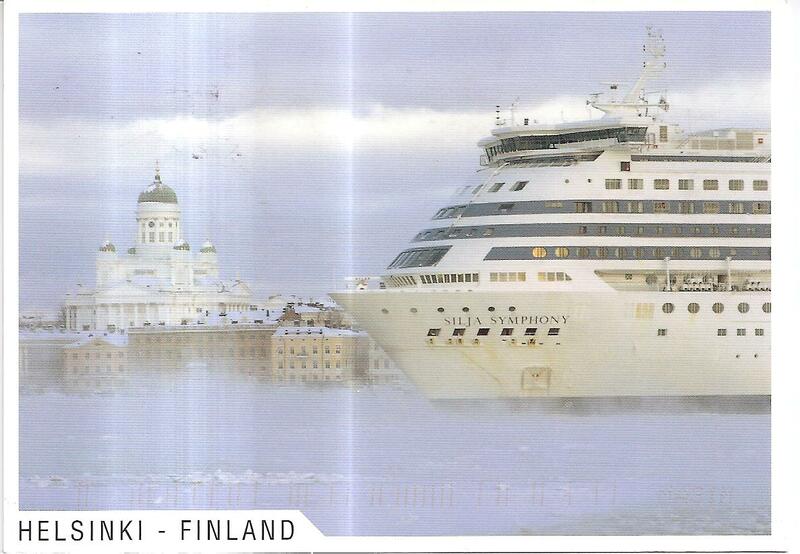 It shows a big ship in South Harbour, Helsinki during winter. 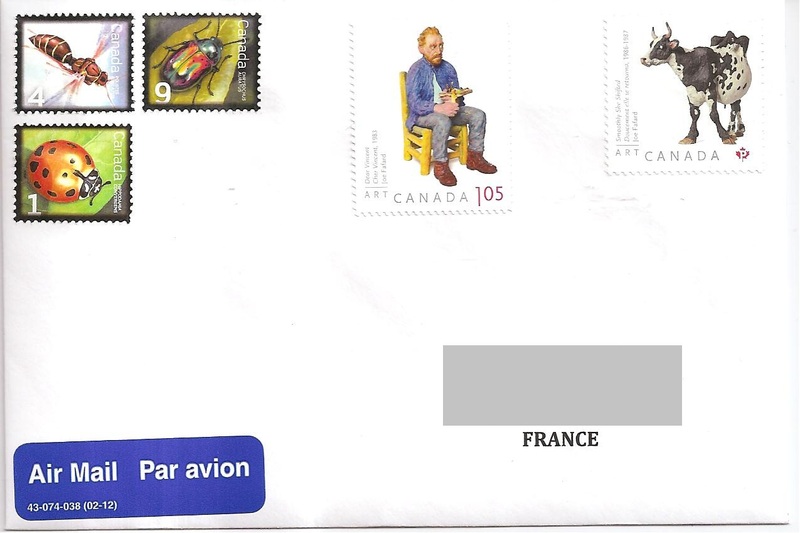 On the back, Spelkone affixed three stamps. The square stamp on the right is a beautiful Christmas stamp entitled ‘One the way to get a Christmas tree.’ There cancel is also beautiful. 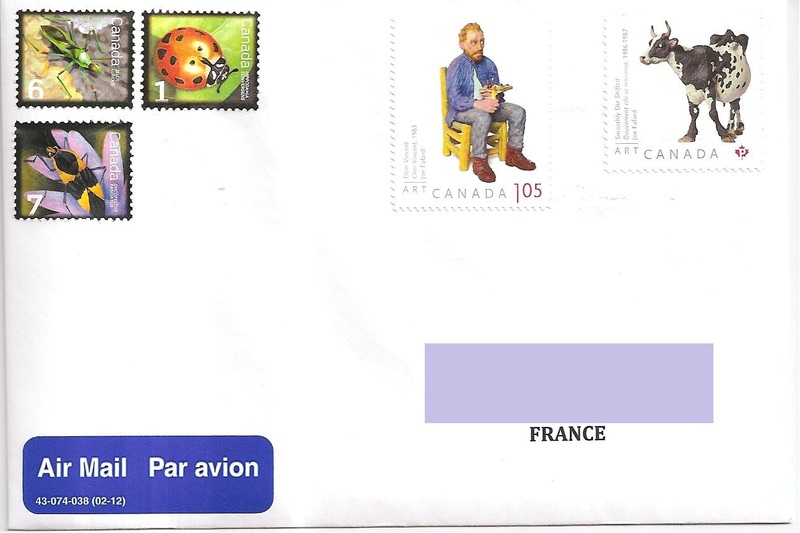 The postmark date is 29 May 2012 and the location is Post Museum. Thanks a lot Spelkone! 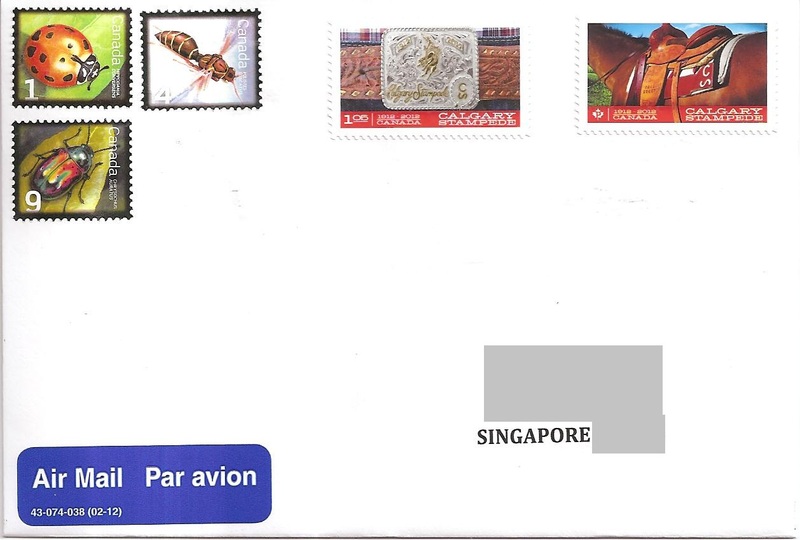 Today I received a cover from Thailand, sent by Nina for the 5-5-55 Group arranged by the Nice Cover Circuit in postcrossing forum. 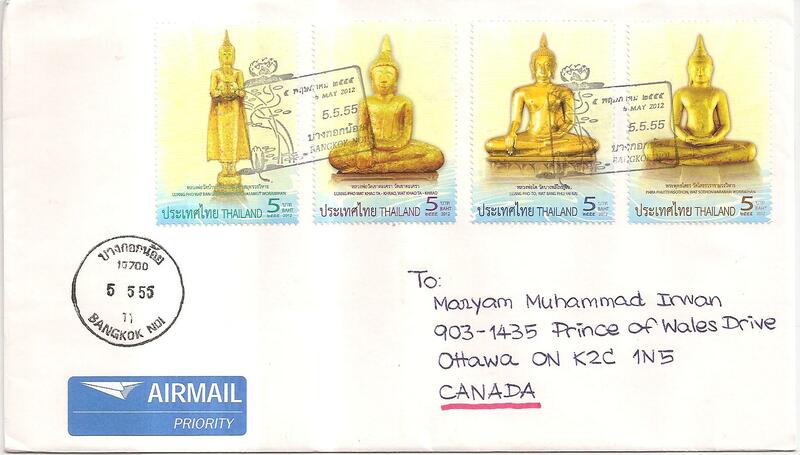 On the cover, Nina affixed four stamps that depict Buddha golden statues in several temples in Thailand. Thailand follows the Buddha Era Calendar and hence the year 2012 is actually year 2555 in Buddhist Calendar. Thailand Post celebrate the unique number 5 – 5- 2555 (which is 5 May 2012) with a special postmark 5.5.55. Thanks a lot Nina! 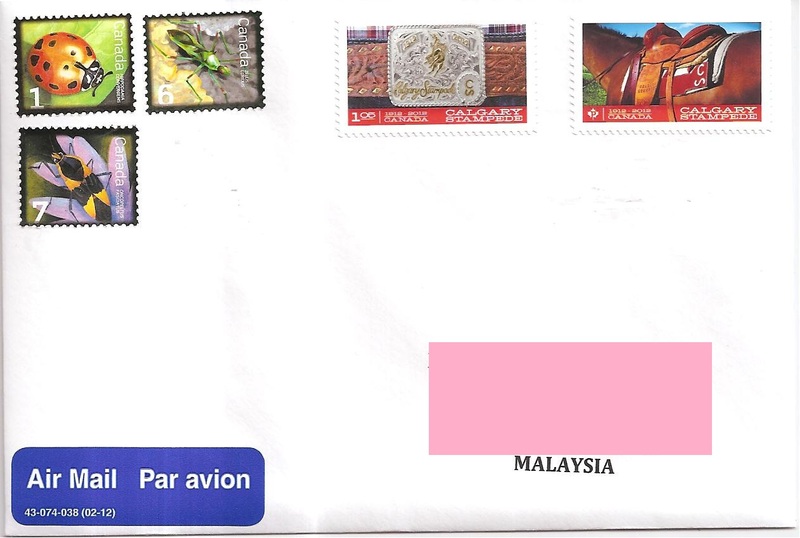 Today I received a cover from Malaysia, sent by Ian Choong from Selangor. 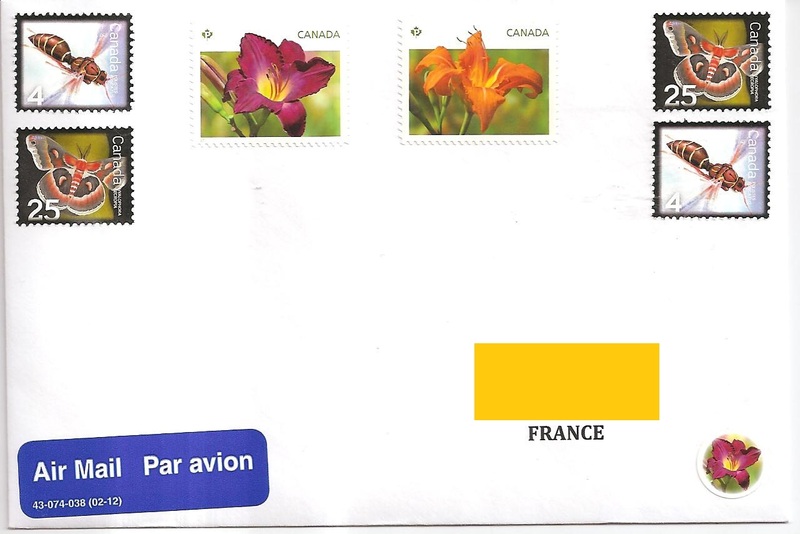 Ian affixed two stamps from the newly issued aromatic plants series, plus one definitive 20 cent spotted dove stamp to make up the postage rate. 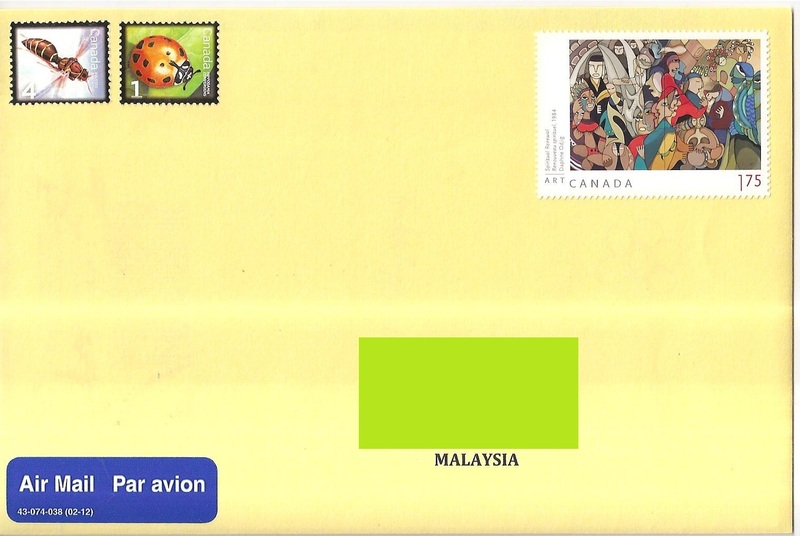 The postmark date is 24 May 2012, an the location is Pusat Mel Nasional Malaysia. 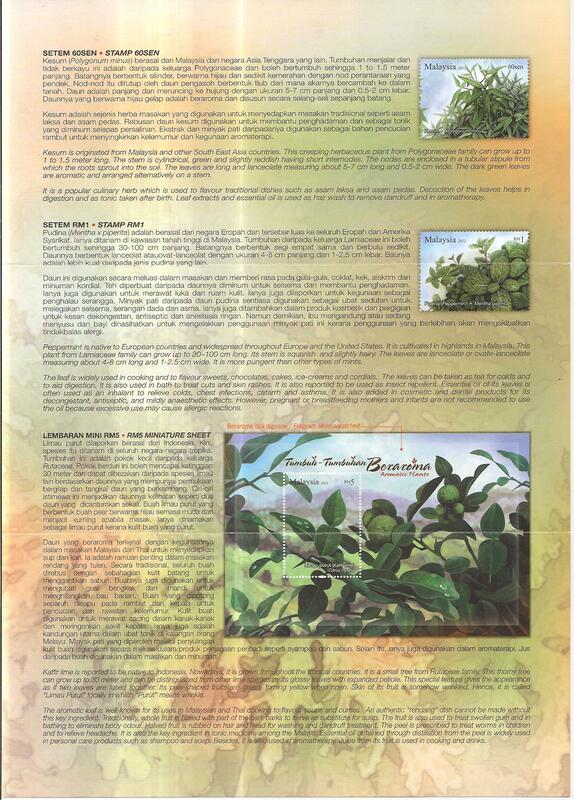 On the back of the cover, Ian managed to put the thematic cancel for the aromatic plants issue. The cancel’s date is 24 May 2012 and the location is Kajang. Thank you very much Ian!